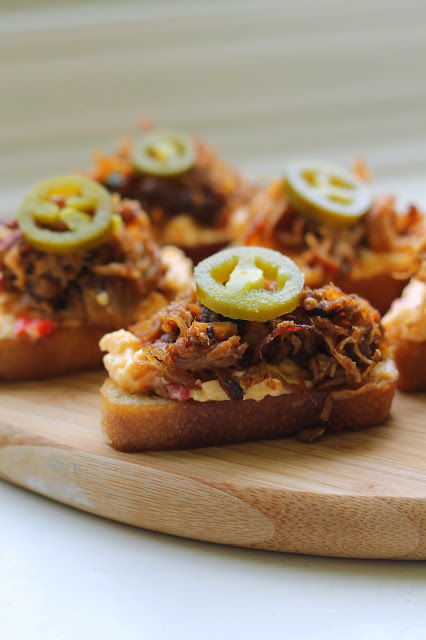 Today I want to share with you my go to, some-assembly-required appetizer, for when you need a quick party trick and are running low on time: Pimento Cheese and Pulled Pork Bruschetta. This appetizer came to be one day when a friend invited us on her boat for a little cruise after work. We enjoyed cocktail hour on the boat and of course I couldn't show up empty handed, but I only had about twenty minutes after work to put something together. I went to Whole Foods to pick up something prepared when this idea came to me. Every since, it has been my go to and one of my most requested recipes! Whole Foods almost always has pulled pork on the buffet, which is what I buy for this. Most stores have prepared pulled pork in the refrigerated section if you need to buy it earlier, or don't have a Whole Foods. I choose my favorite brand of pimento cheese, but you could also make it homemade if you prefer. Serve on toasted bread or prepared crostini and you're all set! Spread pimento cheese on prepared crostini. Top with a generous spoonful of pulled pork. Serve topped with jalapeños or pickles, or serve on the side so guests can top their own.